There aren’t very many kids who don’t spend some section of their childhood absolutely fascinated by ancient creatures. As they’ll tell you, it’s nearly impossible to talk about these beasts without considering the reality of their extinction. It’s also nearly impossible to talk about them without talking about evolution. 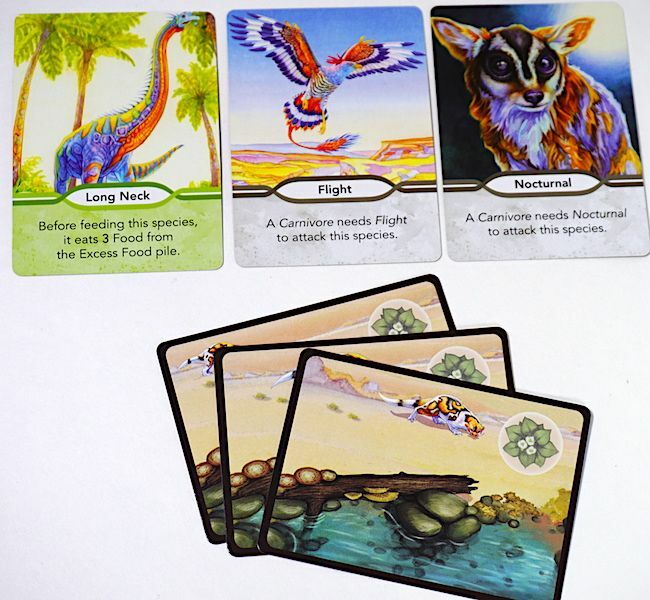 The evolution of species is at the core of a family of games from North Star Games. Today we’ll look at the family-focused entrant into the Evolution series, Evolution: The Beginning. Evolution: The Beginning is a hand management/simulation game by North Star Games and designed by Dominic Crapuchettes. It plays 2-5 players ages 8+ and lasts for approximately 30 minutes. Like the rest of the Evolution series, Catherine Hamilton brilliantly illustrated the box, rulebook, and components. The rich colors are immediately captivating, and the excellent art design is evident throughout the rulebook and components. North Star structured the rulebook expertly; the rule explanation progresses through the phases of the game with easy to understand sections, a card glossary at the end, and a player aid on the back to supplement the two aids included in the box. They also included a link to a convenient how-to-play video on their website. In Evolution: The Beginning, your goal is to have the highest score. You achieve this by eating as much food as possible and growing your species as much as you can. Setup in Evolution: The Beginning is simple. Place the Watering Hole tile in the middle of the table, hand each player a food bag, pile the food tokens in an easily accessible place, and stack all of the cards face down to form the deck. Gameplay proceeds through four steps: Gather, Adapt, Eat, and Score. The Gather phase is rote steps every turn: Add two food from the food pile to the Watering Hole, take a card from the top of the deck and put it face down in front of you to form a new species, and draw three cards. During the Adapt phase, players can create another species, add population to an existing species, and/or add or remove Traits from their species. There is no limit to the amount of times the player performs these actions or the order in which they’re taken. 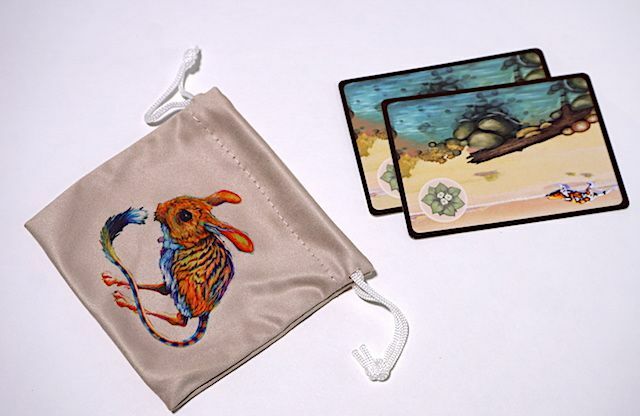 To create another species or add a population to an existing species, the player places one of the cards from their hand face down sideways in front of them. In the case of a new species, it forms a new pile. In the case of an existing species, the face down card is placed on top of an existing pile, offset, so the size of the population is clear. This player has one species with two population. Players can add Traits to existing species by playing a face up Trait card above that species. No species can have more than three Traits, and no species can have the same Trait more than once. If a player wants to put a Trait on a species that already has three Traits, they can discard one of the existing Traits to give it a new one. During the Eat phase, each species must eat food. 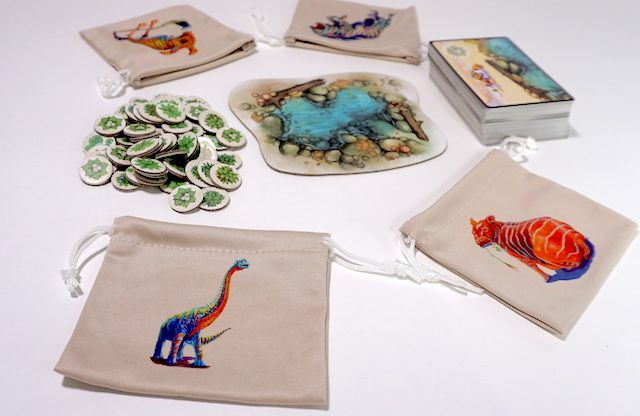 Non-carnivores take food tokens from the watering hole and cover the food token icon on each of their species cards. Carnivores (species with the Carnivore Trait) eat other species! A player with a carnivorous species chooses another species to attack (including their own if necessary). That species loses one population (going extinct if necessary) and the carnivorous species gains two food tokens from the excess food tokens (NOT the watering hole). It is here that Traits are so critical. Players must consider the Traits of a target species when deciding whether or not their carnivore attacks them. If the species has defensive Traits (Flight, Nocturnal, Burrowing), the carnivore must have matching Traits in order to hunt them. Some other Traits have different effects, including Defensive Horns, which causes damage to attacking creatures. There are also Traits that modify the growth of a species (Fertile) or the eating capacity of a species (Long Neck). By the end of the Eat phase, every species must have a food icon on each population card they have. If any do not, those species population cards starve and are discarded. Players must discard any Trait cards that are on a species that go extinct (loses all population), but draw from the deck new cards equal to the number of Traits discarded. Finally, during the Score phase, species eat all their food and players put it in their Food Bag. Any food left in the Watering Hole remains. The game ends when the draw pile runs out, and everyone finishes their final turn. The player with the most food in their bag, plus the number of cards they have played, (species population+traits) wins! I had a lot of hope for Evolution: The Beginning when I initially played it. I love the reuse of the cards to minimize components and the dynamic of the carnivores potentially having to do damage to the player that owned them (even to the point of cannibalism) was interesting to me. Unfortunately, the game got stale quickly. There are only ten Traits in the game, and four of them are defensive Traits which are essentially the same as each other. While the remaining Traits added some variety, it never seemed like there was enough there to build a coherent strategy. In slimming down Evolution into The Beginning, the game lost too much of the mechanics that made it interesting. It’s a nice stepping stone into the series, but unless that specifically is the goal, the mechanics here were merely serviceable, stopping just short of fun. That said, North Star Games built a robust suite of games around Evolution. The Beginning is like a little brother; there’s potential there, but not until he grows up. Despite the listing on the box, The Beginning is better suited to younger (6+) precocious gamers; the mechanics are simple enough, the only barrier is the ability to read. In contrast, the original Evolution is (appropriately) rated 10+. It is filled with novel game mechanics, more variety, and will grow better with your gaming family. You can find Evolution: The Beginning sold by aftermarket sellers on Amazon, but Evolution is available as well from Amazon directly and is a more complete game. You can also look in your friendly local game store. 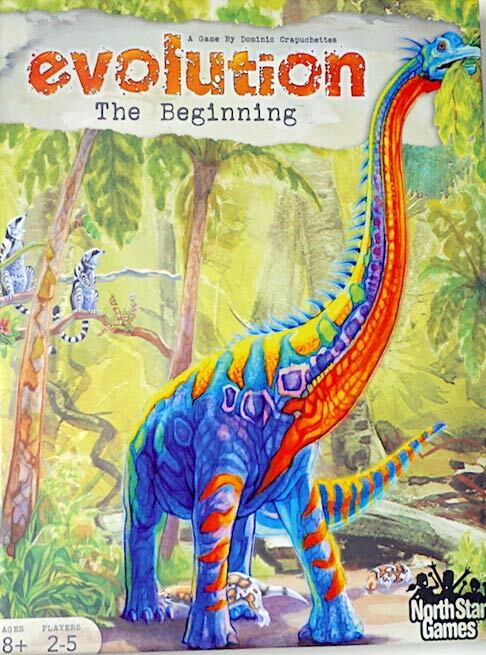 North Star Games provided The Family Gamers with a review copy of Evolution: The Beginning for this review.